THEY have brought camping to the masses in search of a cheap weekend in the great outdoors. But Scotland's national parks are now having to deploy extra rangers to deal with an epidemic of abandoned campsites – complete with cut-price supermarket tents, sleeping bags and other equipment – in beauty spots. Officials in the Loch Lomond andthe Trossachs park and the Cairngorms are routinely discovering tents still erected but otherwise deserted by revellers who have gone home without clearing up. Other tents have been set alight and left to smoulder. In some areas on the shores of Loch Lomond, rangers attempting to get across the responsible camping message have had to be accompanied by police to deter a violent or abusive reaction. Bridget Jones, the visitor experience manager at Loch Lomond and the Trossachs National Park, said: "This is one of the most significant problems we have had to deal with in the last five years due to these incredibly cheap tents. "Certainly this year we have had to provide an increased ranger presence in the park. "This isn't a bit of litter, it's more a form of fly-tipping." Tents were once an expensive commodity, but cheaper materials have now brought a drastic reduction in prices. Supermarket chain Asda is selling two-man tents for£10 and Tesco sells a camping set for £14.99 which includes a two-man tent and two sleeping bags. The Outdoor Access Code adopted by the Scottish Parliament was aimed at increasing the number of people, particularly from urban areas, visiting the countryside. But it has also led to more so-called "wild camping" in which visitors pitch their tents outside official sites. One hotspot has become the east shore of Loch Lomond, which every weekend is becoming a temporary home for young males between the ages of 19 and 24 from across the central belt. Jones said: "From a National Park Authority perspective we want to encourage people to come and enjoy the special qualities here, but it is also our job to reduce the incidents of antisocial behaviour and encourage responsible behaviour that will protect this special part of Scotland." The park is now considering setting up its own "semi-formal" campsites "where we can provide firewood, compost and toilet facilities while folk can still have the same experience. Then we can actively educate, alongside the police, on appropriate camping." David Richards, who owns the Immervoulin Caravan and Camping Park in Strathyre within the national park, said every weekend there are tents left behind. "Some of them are not even taken down," he said. "The problem is much broader in the form of wild camping. People are pitching tents next to the vehicles, tearing up the national park and burning trees all for the sake of not paying a pitching fee." The Cairngorms National Park Authority (CNPA) said: "There have always been occurrences of inappropriate camping in the Cairngorms National Park, long before the advent of the throwaway tent, but we are seeing some instances of all of the camping equipment being abandoned now as opposed to just litter – which is bad enough. "The CNPA is working with land managers and ranger services to deal with camping hotspots and to encourage responsible camping." president of the European Commission - the unelected body responsible for generating European law and the day-to-day running of the EU. But rather than another article preaching a lesson on European operations, there’s something a little more exciting than cod going on behind the fog-tinted doors of Brussels. A leadership contest. 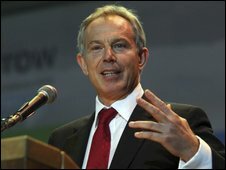 Blair’s attempted coup d’etat has failed to attract a following – the corridors of Brussels are as cold as a continental breakfast for the former Prime Minister. Even his bruised socialist allies, who were battered in June’s European elections and desperate to prop-up dwindling support, have turned their heads. Martin Schulz, chairman of the European Parliament’s socialist group, made it plain that he and other Continental socialists didn’t want the EU presidency to go to “a Brit”. Around 20 of the EU’s 27 governments are controlled by the centre-right. The odds didn’t look great in the first place. But was ‘a Brit’ ever really in a position to represent Europe and her people’s interests to the world? After all, The UK is semi-detached from Europe. Most notably it is not in the euro area and is not in the Schengen zone permitting border-free travel around the EU. The French made clear in Brussels today that Blair had lost their support. Nicolas Sarkozy stating that “people whose names are picked from the hat first, rarely ever get the job”. Any dwindling chance of a last minute resurgence in support for Blair’s candidacy may ultimately depend on his Butlin’s companion - the centre-right premier - Silvio Berlusconi. The well-oiled Italian leader is perfectly happy to see Blair in the job. But can Chancellor Merkle be persuaded by a bit of Mediterranean flair? SCOTLAND is enjoying its biggest boom in camping since Barbara Windsor lost her bikini top in 1969. Tens of thousands of recession-hit Scots are this summer getting their first taste of holidays under canvas, Scotland on Sunday can reveal. Bookings for camping and caravan sites across the country are up by between a fifth and a quarter on last year – hitting levels not seen since the simpler and more austere days of the Carry On films. Some sites have told Scotland on Sunday they are so busy they have to turn away would-be campers. Even the usually sedate Caravan Club said nearly half of its 27 big sites north of the Border were booked out this weekend and next as occupancy rates soar 21 per cent above their levels for 2008. Its rival, the Camping and Caravanning Club, yesterday said its Scottish sites were brimming. Spokeswoman Dawn Henton said: "We have seen a boom in camping and caravanning this year, and many people are booking ahead to secure their perfect pitch. "Forward bookings for Scottish sites have risen by almost 25 per cent since this time in 2008, which equates to over 12,000 bookings." The club has seen a slightly smaller rise of 16 per cent across the UK, although English and Welsh families tend to take their summer break a month or so later than Scots. Industry insiders yesterday said that the camping and caravanning sector was being given a huge lift by the floundering pound and ongoing fears of job losses. Holidaymakers are turning their backs on expensive package holidays to the Eurozone in favour of some more basic pleasures much closer to home. David Richards, who owns the Immervoulin Caravan and Camping Park in Strathyre, near Callander, said his site was up 30 per cent on the year. He said: "The credit crunch is helping us. Regulars come frequently and we're getting people who haven't been for five or six years. We're also getting a lot of people who we've been recommended to. Many have never camped before. They need somewhere that will look after them. "We're getting a lot more English people, but it's still 90-odd per cent Scots." Kath Campbell, co-manager of Braidhaugh Holiday Park in Crieff, which is fully booked at weekends, backed Richards. "We're certainly noticing more new clients," she said. "I'm hearing people saying 'It's all new to me', when booking in. Predominantly it's Scots, but we've had a small rise in foreign bookings too. The weak pound is certainly helping." Travellers from the continent coming to Scotland now get about 30 per cent more for their Euro than they did last year. Camping, meanwhile, is becoming the cool way to spend a holiday with major celebrities, like Kate Moss, putting their names to the pastime. Tents, moreover, are cheap as holiday homes go. It is possible a two-man version can cost less than £10. Tourism industry leaders, however, remain split over whether a camping boom is good for the economy or not. There are still no figures on occupancy at hotels and holiday cottages and flats. Some tourism chiefs prefer to see big-spending hotel-stayers than penny-counting campers. But the Caravan Club isn't so sure. Its 60,000 Scottish members can have an impressive impact. Over the whole of the UK, caravanners inject an average of £17 million into the economy every year. Big camping and caravanning groups, meanwhile, said would-be holidaymakers shouldn't despair if they are struggling to find somewhere to stay. The Caravan Club stressed that there were still pitches to be had this summer, even at weekends. It also has dozens of "five-van" sites that have spaces. The Camping and Caravanning Club stressed that its members can book smaller "certified" sites, often with just five pitches each. There are 40 in Scotland and they can take a family of four for as little as £40 a week, although facilities can be basic. Scottish Government officials however, are also understood to think that the camping boom will do more good than harm. A spokesman for VisitScotland, the national tourism agency, yesterday said: "There are a number of factors contributing to the high demand for camping and caravan holidays but perhaps most notably is the current economic environment and visitors looking for quality and value for money with Scotland providing both of these throughout the country. "It is very encouraging to see sectors of tourist accommodation exceeding expectations in terms of bookings and underlines the resilience of Scotland's tourism industry."